Fresh water pearls or mother or pearls are almost entirely made of nacre which is a substance that is produced inside the shell of mollusks. 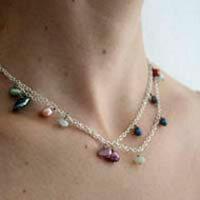 Nacre is mainly formed of aragonite crystals. A pearl is the result of an abnormal growth that was provoked by the presence of a foreign material in the body of a mollusk, like for example a grain of sand. As an answer to this irritation, the mollusk progressively puts layers of nacre all around the strange particle. 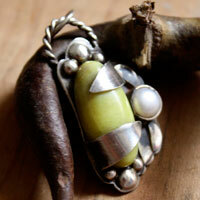 Because this is a particular situation, the mother of pearl is not considered the same way as nacre is. Nacre creates the shell of the mollusks. 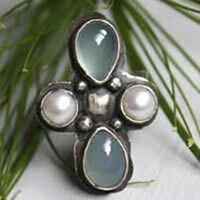 There are 8 shapes for pearls: round, half round, button, drop, pear, oval, baroque and circled. The perfectly round ones are the rarest and the most precious pearls. 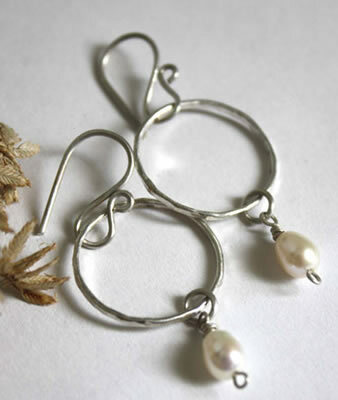 A pearl can last from 100 to 150 years old, due to its organic composition. 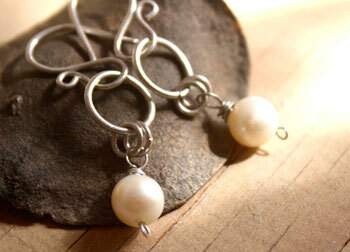 Pearls have been appreciated by all since the Antiquity for being rare, for their beauty and their value. We ignore who was the first who started collecting them to use them. Some civilizations were very fascinated by pearls. Others did not even care about them. It is the case for Japanese people who would only keep the shell until recently. Or for example, for Polynesian people who would just use them as marbles. It seems that the tradition of wearing pearls comes from India and other places in Asia, where Phoenicians used to buy them to bring them back to Europe. The pandyas from the south of India seemed to have organized the recollection of mother of pearls since the 6th century B.C. They would control the fishing of pearls on the south coast of India, Sri Lanka and the Gulf of Mannar and would also organize the business. The Greek historian Megasthen talks about their work and more particularly of the pearl quality of Mannar. They were recognized to be the most beautiful pearls of the antique world. The Chinese really started to work a lot with fresh water pearls from the Chinese south sea in 206 BC. Greek people would call them Daisies but they only really used them after the Persian war. In the Bible, in the proverbs, pearls are mentioned several times. Therefore, Hebrews would know about them. In the Coran, pearls are also mentioned several times as a decorative ornament for the inhabitants of Paradise. For the Hindus, the mythology book Garuda Purana talks about 9 sacred fresh water pearls. Their tradition mentions pearls a lot under the shape of a necklace of 104 pearls for the King Malabar. They symbolize the number of prayers that he had to say every morning. It was also an ornament for gods. They would wear it as a necklace such as Vishnu, the koustubha. In the traditional medicine, Hindus recommend to use pearl powder to stimulate digestion and to cure mental diseases. Nowadays, most of the pearls are grown artificially. As the production is big, it is less difficult to find perfect ones. Pearls in the wild are difficult to find as you have to open a lot of oysters to find a perfect one. Basically, you have to introduce a foreign object in an oyster and it will start reacting to protect itself and make a pearl. Mines: all around the world, but more particularly in Japan, China, Thailand and Tahiti. The Huerfana (the orphan) was one of the most beautiful pieces of the Spanish crown. This big pearls was discovered in the Gulf of Panama. It would belong to the first female governor of Cuba, Dona Isabel de Bobabilla, and disappeared when the palace was destroyed by a fire in the 18th century. The big pink pearl was the biggest fine fresh water pearl that was discovered. This baroque pearl would weigh 470 carats and was found by Wesley Rankin in California in 1990. In 1991, it was worth 4.7 million US dollars. The peregrine is one of the most famous pearls. This pearl is in the shape of a teardrop. It would weigh 55.95 carats when it was discovered. It was the biggest pearl at the time. In 1913, it was cleaned and polished and its final weight was 50.96 carats. An African slave in the Gulf of Panama who used it to buy his freedom discovered it in the 16th century. Then, under undefined circumstances, the King Philip the 2nd of Spain who offered it to the new queen, Mary of Spain, bought it. From the Spanish crown, it went to Joseph =Bonaparte and the queen Margaret, before it was bought by the British marquis of Abercom. In 1969, the peregrina was bought by the actor Richard Burton for 37000 dollars as a gift to his wife Elizabeth Taylor. It was then sold 11 million dollars in an auction to an anonymous collector. The pearl of Abernathy or "the small pearl of Willie" is the finest and most perfect fresh water pearl ever found. It was discovered in 1967 by a scuba diver whose name was Abernathy. He found it in a mussel in Scotland. Despite looking for more, no other pearl of this quality was ever found in Scotland. Only small ones were discovered until the mussel species disappeared. The pearl of Allah or the pearl of Lao Tseu is the biggest pearl ever discovered. It was fished in 1934 in the Philippines on the coast of Palawan. The scuba diver who found it drowned himself but the pearl was retrieved. The emirate of this island gave it the name of the Pearl of Allah. It weighs around 6.4 kilos and has an irregular look. The emirate of the island offered it to Wilburn Dowel Cobb in 1939 for saving his son. His heirs sold it for 1 million of francs to the jeweler Peter Hoffman in 1980. It was estimated in 2006 at 61 850 000 US dollars. The pearl of Gogibus is the biggest fresh water pearl in a pear shape. It was found during the first part of the 17th century in Western India. The 126 carats pearl would have been bought by the king of Spain Philip the 4th to a merchant called François Gogibys around 1620. The king would regularly use it as a brooch on his hats. The pearl of Gresham was offered to the queen Elizabeth by the Prince merchant Thomas Gresham. It was estimated at 15000 US dollars. According to the story, he offered it to the queen as powder on a French toast with a glass of wine in order to impress the Spanish ambassador and to show them that he could offer expensive meals to monarchs. The pearl of the Arco valley is a fine baroque pearl which weight was 575 carats. It became famous because it would have been offered to the Chinese emperor Kubilai-Khan by Marco Polo. There is no historical proof of such a present. This pearl is called like this for the existing family link between the Arco and the Valleys families who were Austro German. The pearl Hope is the most famous fine sea pearl and the biggest one with 450 carats. It is not perfectly round. It is between 5 and 10 cm. The queen of pearls is a round pearl of 27.5 carats that would belong to the jewels of the Real family of the Bourbons. It was bought in 1669 by Louis the 14th and stayed in the family until the royal belongings were sold during the French Revolution in 1791. It was sold for 200 000 livres at that time. It then disappeared. Some say that it is actually the famous Pellegrina that belongs to the Zosima family and that is in the museum of Moscow. It would relieve eye infection problems. 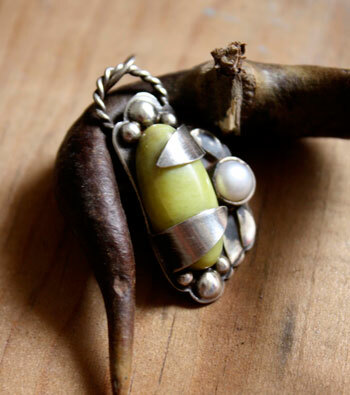 The fresh water pearl would be used for digestion problems. It would be useful for bipolarity treatments. It would be useful for skin problems.